Come and join in, play your part, make your mark at TeamBuilders. Discover some fantastic stories, and find out how you can be part of an awesome team with an amazing story to tell! Team Tactics is designed to help younger children make the most of their holiday club experience. Use with the TeamBuilders holiday club. This fantastic new resource from Scripture Union has everything you need to host the best holiday club in town! With a sports-based theme (that is also suitable for non-sporty children!) there's plenty of sporting action, brand new fun and games, crafting, making and so much more. TeamBuilders helps children to discover what it means to be part of a team – helping them to understand that every role in a team is equally important, no matter how big or small. The TeamBuilders daily programme focuses on awesome stories from the Bible (including Joseph, Moses, Esther, Jesus and Paul) – each one giving children the opportunity to see what life is like on God's team, and inviting them to join his team for themselves! TeamBuilders Team Tactics booklet for 5-8s by Alex Taylor was published by Scripture Union in October 2017 and is our 837th best seller. 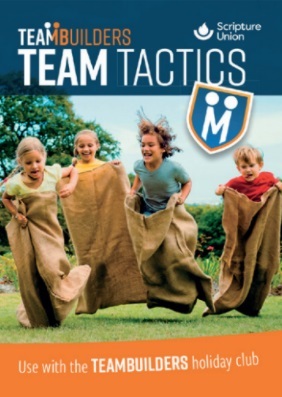 The ISBN for TeamBuilders Team Tactics booklet for 5-8s is 9781785066658. Be the first to review TeamBuilders Team Tactics booklet for 5-8s! Got a question? No problem! Just click here to ask us about TeamBuilders Team Tactics booklet for 5-8s.